We were supposed to go swim yesterday but the kids have so much to do: Dada has exams, Che has her egg Science project, poems, etc. And so we settled for Blue Corner as my treat for my ACB graduation. And it was the better decision coz it was very windy with the impending typhoon Goring. Here's what we had: Sizzling Pusit, Sizzling Liempo x2, Sizzling Blue Marlin and Pinakbet. Renz is happy and shows it. Tita Gay's taking the pic. See how strong the wind was. Renz was already happy just with the free soup! After lunch we went to Speedo where Tita Gay bought a new swimsuit on sale. Then we went to National Book Store (new to us) for some supplies and where I bought the business inpsirational book "Go Negosyo". 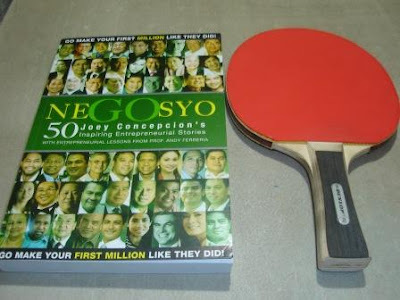 We then went to a sports shop were I bought a new pingpong racket (Dunlop) for Php299.